I appreciate being able to go back and read these reviews. How much has changed in 6 years.. It is a shame Windows Phone ended the way it did. I don't know how to transfer files using HTC titan Bluetooth. I don't know how to use its Bluetooth since I can't transfer music from other phone going to HTC titan. Anonymous, 16 Dec 2011excellent audio output, better and louder than iphone 4, but still not challanging old nokia n... moreit is due to LCD problem. Since i have the watrrnay period i consulted HTC AUTHORISED SERVICE CENTRE - CELL INFOTECH, Egmore, Chennai and HTC SERVICE CENTRE - Basvangudi Branch, Banglore, but i got ill responses. MR Uday Kumar, 9884090092, Cell InfoTek Chennai, ill-treated us,i came all the way from banglore to chennai to get it serviced but there is no proper response and especially the guy guided us badly.My whole 26,000 rs is wasted now. Whos gonna answer this. This is the way you treat your customers.I have no complains over the phone, it is the smartest phone ever but service centres are too bad, please educate those service providers to behave properly with the customers.Please take necessary steps to bring back my phone and take immediate actions on those service centres. asd, 15 Dec 2011if it is 4.0inch screen size, i will buy itgoal was probably to crmoape web browsing experience at their best. The thing is, with a WP, you have only IE9 and with an androphone you have the choice between different web browser. Oh, and i have a galaxy s II and i'm using the stock web browser (cause of full flash plug in performance). Trust me, it's really fast. No flash on WP device, so you're stuck to HTML5 video web site. This is a big deal if you like watching TV shows and anime. AnonD-3485, 15 Nov 2011The only advantage there is the front facing camera. This huge screen is an disadvantage and m... moreJust like u said not everyone like big screen also means not everyone hate big screen so its not official disadvantage feature... as per the review made by GSMarena on NOKIA Lumia the audio the result was "mixed bag" so Lumia is not the best out there... S-LCD screen is very good but not as good as the Amoled screen and Lumia doesn’t has Amoled screen and the positive side for Lumia screen is "Scratch resistant Gorilla glass" and in GSMarena review they mention in the Disadvantage concerning the screen of Lumia "Display is much dimmer than the N9's display" also don’t forgot "microSIM card slot"
Mugen Power released a 1950mAh OEM sized extended battery for HTC Titan. Great review. One of the first honest ones I've read that deals with Wp7. I've had mine since the original launch and have loved it since. I don't understand the big push for dual and quad core type windows phones though. The only benefit that I hear you get from it is 1080 video recording. This is not a feature that I think people use that frequently. Maybe some video games would look and perform better on performs dual core system. If so, that's a legitimate reason but still not a show stopped as a phone is more geared towards casual gaming when you have downtime. I'd love to heat why this is a big deal. Its needed on the android platform because the thing is slow. We don't have that problem. volodymyrqa, 17 Nov 2011I am not buying Titan for one main reason: - in a such a big screen you still need to zoom-in... moreYou still need to zoom in to see text?? What font size do you have your phone set to? - in a such a big screen you still need to zoom-in to read text. placed my order for this phone waiting patiently for it to arrive . 4.7 inch mini tablet bring it on !! Quad-core processing = quad-core power usage, for negligible performance gain. I'm all for powerful mobile computing, but such power is better in a slate than in a phone. IMHO phones should last for days without charging - this just isn't a priority for modern handsets and that's a bit of a shame. Cyd07, 14 Nov 2011"The Titan certainly keeps the Nokia Lumia 800 at a safe distance. " I don't really... moreGet real, Amoled and (S)LCD are both manufactured by Samsung(&Sony). Samsung is currently using Amoled instead of (S)LCD. Guess why they are doing that. Yeah, because Amoled is superior than LCD. I don't particularly understand all the hate for a larger size screen. I find a 7" tablet fits into the pocket fine. Something like this is a breeze. Maybe just folks down my way are taller or something? A bit disappointed by the res though. 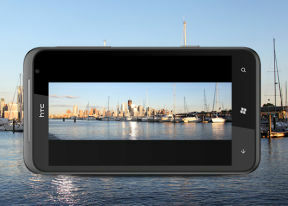 I'm guessing WP7 doesn't support or cater for High (or HD resolutions) just yet? Is that in a coming update?